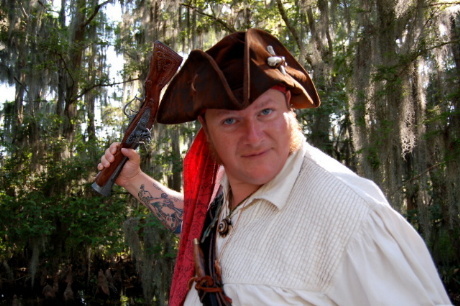 Pyrates in the Cypress Swamp! As you might recall, Kim the jewelry maker launched her new Etsy site here last year by giving away a very stunning garfish scale earring and pendant set. The winner of that set was a fairly new reader, Capt. John Swallow. Kim exchanged a couple of emails with the good captain, shipped him his prize, and related to me that he was a very nice and interesting fellow. Later, I received an email from Capt. Swallow in which he included a link to something called NOLA Pyrate Week. First off, I thought maybe he could not spell, but when I asked him about it, he shared the evolution of the word and informed me that this was indeed a more historically correct spelling. When I visited the link, I learned that Capt. 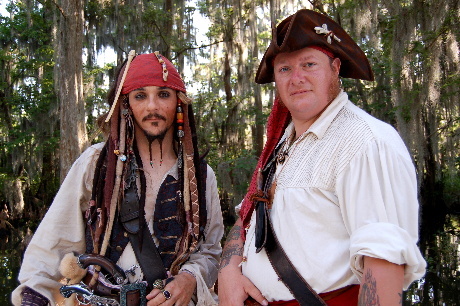 John Swallow and his quarter master, Seika Hellbound, started this very unusual pyrate event back in 2007. Using history, culture, music, and authentic period clothing, they raise funds for and increase awareness about the people and wetlands of coastal Louisiana. That is why I now refer to them as my Philanthropic Pyrate Friends. Capt. Swallow invited me to be his guest at the New Orleans Bookfest at the Audubon Zoo and sell and sign copies of my children’s picture book, Before the Saltwater Came. I had the pleasure of sharing the table with an impressive new author, Jake Webber, with his first book, Lafitte’s Black Box. The following week, Capt. Swallow and Q.M. Hellbound kicked off their NOLA Pyrate Week with a Friday night parade in the French Quarter, with pyrates walking the old streets, throwing beads and doubloons. The following Saturday and Sunday was spent at the Pyrate Marketplace, located outside the Aquarium of the Americas, with craftsmen and women selling handmade items including jewelry, ironwork, leather work, and books. I’m not sure what else those philanthropic pyrates did throughout the week, but they ended it with a drive down the bayou last Saturday. And I wish you could have seen the faces of the people at the marina and heard the comments they were making. 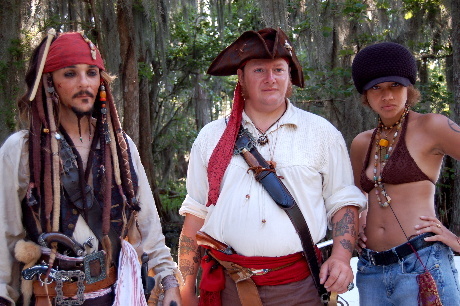 Things like, “Ahoy, matey, can I take yer picture,” spoken in their best pyrate lingo. I thought at one point there would be a boat wreck at the landing with all the heads turning and doing double takes. Some of the remarks were just downright hilarious, with the pyrates laughing the loudest. I asked them if they always draw so much attention everywhere they go, and the answer was a definite YES! And I can certainly see why. Three more authentic pyrates I have never before seen. 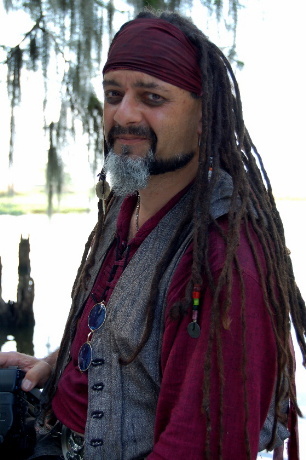 There was Captain Jack Sparrow, a very quiet, pensive pyrate with a swagger indicating he had a taste for the rum (even though he had not been drinking at all). And there was the big one who goes by the name Irish and hails from Ireland, speaking with a genuine brogue. Irish impressed me with his eye for the birds, in spite of the fact he carried a substantial weapon called a Blunderbuss, which is Dutch for “thunderstick”. He explained that in lieu of musket balls, the pyrate would fill the gun with shards of glass, tacks, or nails. Then, as they approached another ship, he would hold the gun down at hip level and would blast the ships-men and overtake them. We eventually found our way up into the cypress swamp, where we drifted under the moss, listening to the sounds of frogs, birds, and gators. We pulled into a gap in the cypress knees, sat and talked for a long while. These city pyrates were taking it all in, asking questions about the plight of the vanishing wetlands of south Louisiana while I got lost in photographing them. They brought with them a young Creole woman whom they met at their marketplace the weekend before. 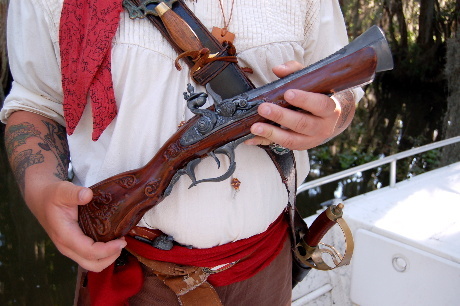 Her meeting of the Pyrates encouraged her to dig deeper into her Barataria ancestry, where she might find out more about her ancestors being privateers. Who knows? Some of her kin might have even hung out with Jean Laffite, the famous pyrate of the Gulf Coast. It was my pleasure to have my old deckhand, Termite, on board for the journey. And just in case there might have been a mutiny, I left the GPS at home so that these pyrates would not be able to commandeer my ship and escape the secluded swamp. We would have been stuck there (they would have never found their way out without the GPS) until the Swamp Dwellers wandered from their camp and saved Termite and me. It appeared that Capt. Swallow and his crew of pyrates had a jolly good time on the M/V BAB. It will be quite memorable for me having such a great historian on board, along with such interesting characters. It is my hope that I can block off my calendar this time next year to attend more of their philanthropic pyrate activities, known as NOLA Pyrate Week. 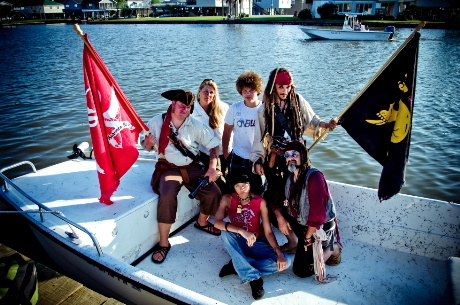 After it was all said and done, the pyrates raised funds and donated them to the Barrataria-Terrebonne Estuary Foundation. Kim is our mate…we’d never take treasure from a mate! Of course as Pyrates o’ the New World (or as Capt. Wendy has dubbed us, “Philanthropic Pyrates”, we tend to give back more than we take! I’m guessing a pirate, I hope he left rum. I say either Captain Swallow or Quarter Master Seika from the book fest. Aha! Very astute of you! The story is posted if you want to read it! What an wonderful article – though not nearly as wonderful as the day on the Bayou we spent with our good mates! Mutiny? Us? Never! We run a tight ship and take no truck with such behaviour. I would also like to point our how absolutely impressed we all were with the high level o’ skill & knowledge shown by our newest mate – First Mate Termite! 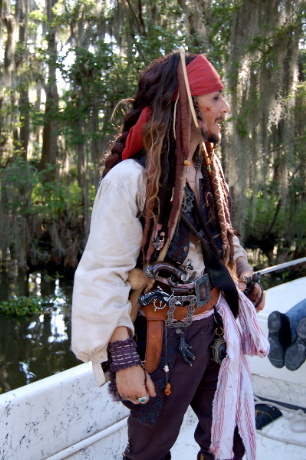 Clearly he continues an education in the Bayou that no amount o’ years in “school” could ever match…he’ll make a fine Captain…with a bit o’ botanist, biologist, zoologist tossed in! As I have just docked in me northern port again it will take some time to collect & process the photos & video taken while down there – rest assured some will be presented here. And we are anxiously looking forward to said postings, Captain!!! This is a fantastic article!!!!!!! Thank you, Kelly!!! They made for very interesting information and writing!!! BW this was a fantastic post. I bet you and Termite had a wonderful day with that crew. It’s great to see them raising funds for the foundation. I’m definitely going to check these guys out some more! This is very interesting and I thoroughly enjoyed reading of the exploits of Captain Wendy and her friends the Pyrates! I’ll be looking forward to the posts by Capt. Swallow! This is a great post, and it was a lot of fun to read. Kudos to these “pyrates” and the good work they’re doing. Great costuming, too! However, I would add just one little note – while we enjoy their exploits, let’s not forget they bear no resemblance to the real pirates running free in the world today. While incidents like the murder of the four cruisers aboard S/V Quest off the coast of Oman get the publicity, there are hundreds of unpublicized incidents every year, all around the world. Maybe more. I have friends whose boat was boarded in the Andaman Sea. Luckily, they were only roughed up, and items stolen. People with whom they were transiting had their boat taken. Roz Savage, who rows the oceans of the world on behalf of environmental causes, has had to adjust the course for her current voyage, and will not be transmitting her location publicly because of piracy fears. In the past, such activity has been confined to specific areas, particularly off the east coast of Africa, but it is spreading. And while some doesn’t appear in piracy statistics because it doesn’t happen in international waters, piracy it is. I really don’t want to be a wet blanket, but I guess I feel about pirates the way some folks in Louisiana feel about BP. Enjoy the fun – and it is fun! – but when you read about pirates in the newspaper or on the web, just remember – it’s not the kindly Capt. Swallow and his crew they’re talking about. 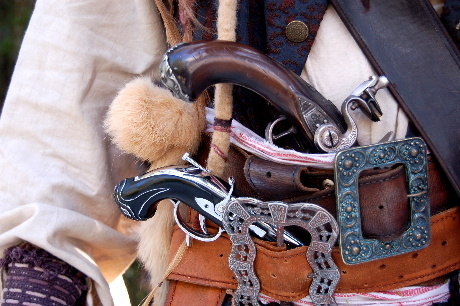 Moderns pirates tend to prefer AK-47s to a blunderbuss. Thank you for your words of wisdom, Linda, and I think I will let Capt. Swallow respond! Totally off topic – but looking at my Knockout roses beginning to bloom after all the snow we had this winter – made me wonder if the ones you planted survived and whether you were pleased with them???? OH MY GOSH YES! I trimmed them WAY back, back in early February, and they are FULL OF BLOOMS right now and so pretty! I pluck the spent flowers off and feed them to my chickens to encourage new blooms on the bush. I am very satisfied with them! Blu might get yeller ones to do the east chainlink fence. Had carpet roses at Mom’s that grew all over porch supports. All of my hybrids died and came back up as red roses! Even my long stem yellow one. Just returned home from a grandsons band concert. It was based on New Orleans Jazz and the big band sounds of Duke Ellington with some Louie Armstrong tossed in. Boy, do I have a headache now! They were loud. Well, you were a loving grandma to go to the concert!!! Did you have a red rose planted near your hybrids? No red roses any where near that side of the house. I had a yellow long stem, a gorgeous Queen Elizabeth? I think that was white and smelled heavenly and a peach colored one. The only red rose was about 65′ away from them and it was there when we moved here 36 yrs ago!